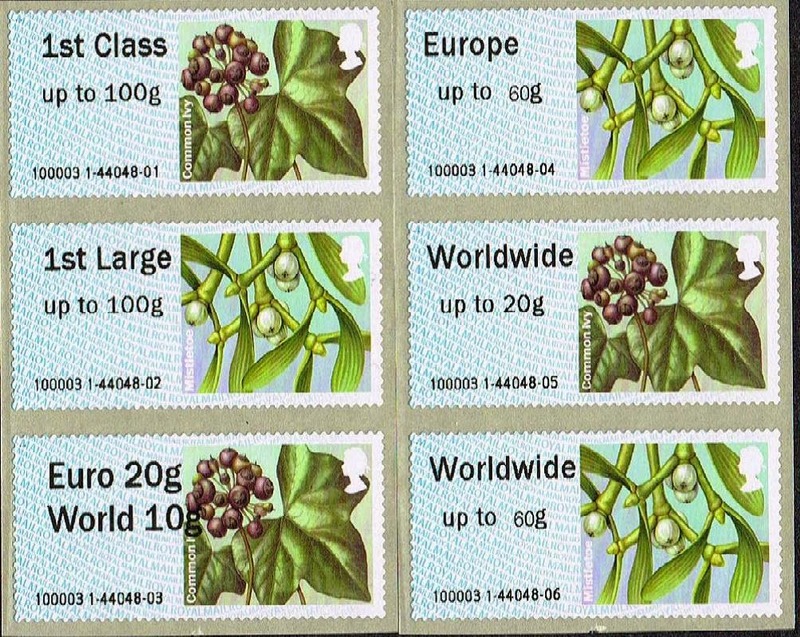 Winter Greenery Faststamps will have taken many collectors by surprise because there are only four designs instead of 6, and collectors who only have access to Wincor-Nixdorf machines will find that there are probably only 2! But this does make the collection cheaper, with a basic set of 4 now costing only £2.30 (although the bureau pack is £2.81), and a full set of 16 from NCR machines having a face value of £17.36. 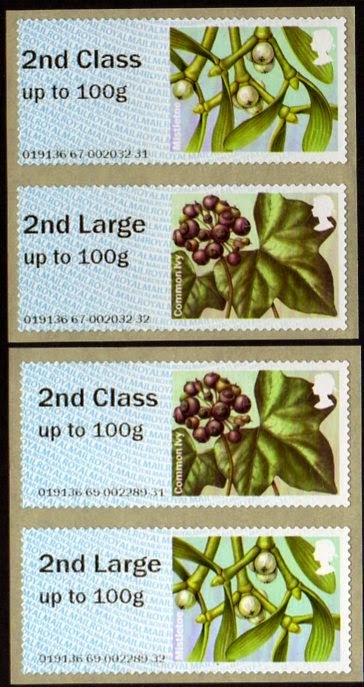 The Bureau Pack contains 1st, 1st Large, 2nd and 2nd Large stamps. Of course they are also available with open values (used on first day). A number of branches still have Wincor machines, I am waiting for a list from PO Ltd. The latest I have heard of is Perth. Incidentally, a detailed report on the developments at Farringdon suggests that individual collectors each bought one or a few sets, with nobody getting a bulk supply, mainly because most of them didn't realise the error in time. Sadly one of the buyers spilled the bins to the staff and the machine was taken out of service until the roll could be changed. Nothing yet on eBay, which tends to confirm the above accounts. Balham Post Office was selling the 1st class type from their Wincor-Nixdorf machine a day early on 12th. Listed on eBay they close on 19 November). Update, per a comment from a reader: this error was Balham's swansong as the machine was removed today (14th). 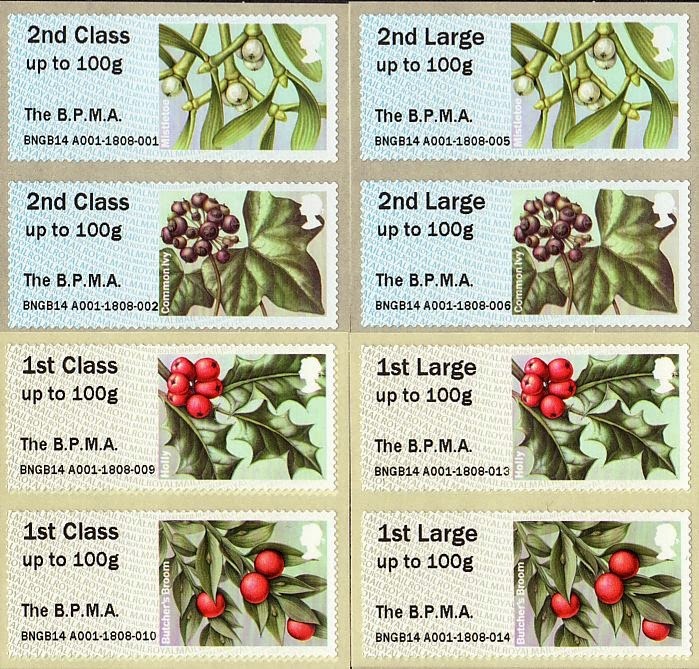 Stamps - but not BPMA or Farringdon - will be in our webshop on Monday. 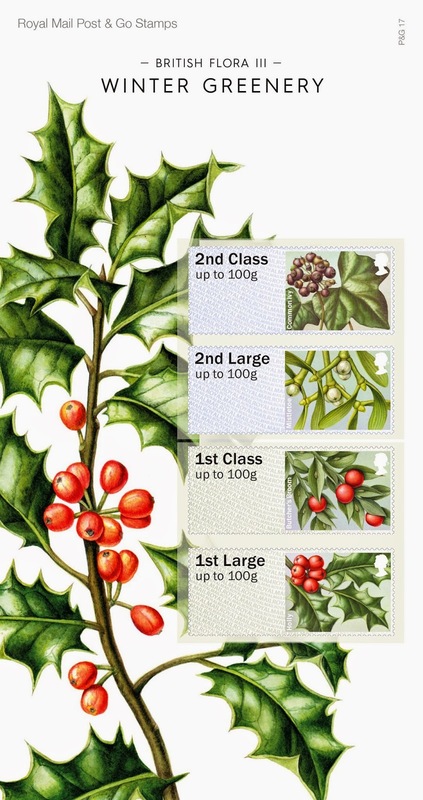 I'm sorry not to have reported this at the time, but for the record the Winter Greenery stamps were available in Edinburgh's Princes Street Mall Post Office on 12th November, one day early. Frankie G - Balham has lost its Wincor...went there today and the machine has gone ! And Finchley Road is still out-of-service. The boxes containing the rolls are marked 1st class or 2nd class depending on the contents. Collectors with little imagination ! The Collectors Strip from the machines will always be strips of 6 (or 2 for 2nd class). What I don't understand, apart from a desire to raise just a little more, is why the Pack didn't contain 2 x 1st class and 2 x 2nd class, instead of including the Large values. Tudor Street Machines 3 & 4 weren’t working this afternoon. 2 gave the impression of working, it debited your card, gave a proper receipt not the “item couldn’t be printed” one but failed to produce the stamp. It seems to me that Tudor Street's Days are definitely numbered. I wonder what they will replace them with - perhaps an IAR machine, because the *features* on NCRs as in branches will be massively underused. NCR do machines which accept card payments only, but less functionality of those in Crown Offices. And St James's Park (Broadway, SW1) had the 1st class designs on sale early, as well - on 11th November. Earliest date i know was easrly on 7th Nov Blackfriars both 1st & 2nd class. PAIGNTON: Only 2 Kiosks have the Winter Greenery they are No's 67 & 69 While No 68 has Poppies. YEOVIL: Also has only 2 Kiosks with Winter Greenery they No's 67 & 68. Why are all the NCRs numbered the same wherever you go?! In the same way that Wincor-Nixdorf machines in branches were numbered from 1 - n, so the NCRs are numbered from 67. Why 67, I don't know. 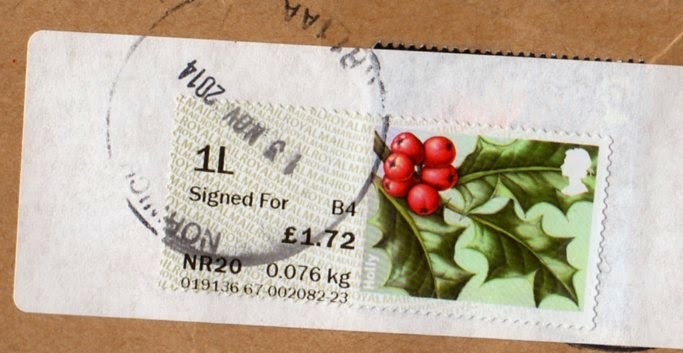 I suspect if you asked the Philatelic Bulletin editor they would say it was a Post Office Ltd matter! I was told that it has to do with aiding the identification of supplier so that the correct firm is contacted about problems/ repairs. As for why start at 67, someone probably misread a had written 61. Apparently it was decided by NCR themselves. Oxford St Aldates main post office. Still no 2nd class winter greenery, the office as not received any at all. First class was available on 8 November. Wirth regard to numbering, the NCR self serve checkouts at the little Tesco where 'er indoors' works are numbered 71 and 72. The one we used in the large Tescos tonight was 78. I wonder if thats significant? (a pointer to the future perhaps)?